Green Business Singapore is conducting interviews with business leaders, companies and organisations, who would share their views on going green and achieving environmental sustainability. To kickstart the series of interviews, we have the privilege of interviewing CapitaLand’s Mr Baey Yam Keng, Vice President, Corporate Social Responsibility. CapitaLand is the largest real estate company in Southeast Asia by market capitalisation. Headquartered in Singapore, the multinational company’s core businesses in real estate, hospitality and real estate financial services are focused in growth cities in Asia Pacific, Europe and the Gulf Co-operation Council (GCC) countries. The listed subsidiaries and associates of CapitaLand include Australand, CapitaMall Trust, CapitaCommercial Trust, Ascott Residence Trust and CapitaRetail China Trust. 1. Describe your organisation’s green initiatives and practices. CapitaLand is committed to be an environmentally sustainable company and a good corporate citizen. Over the years, CapitaLand has won various local and foreign awards for our properties’ environment-friendly designs and features. 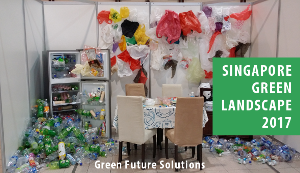 The Group’s Green initiatives are spearheaded by the Green Committee which comprises senior executives from both our Singapore and overseas operations. The CapitaLand Green Buildings Guidelines guide the sustainable development and management of our properties. An ISO 14000-certified company, CapitaLand also has an online Environmental Tracking System to track energy and water usage, waste generation and carbon dioxide emission of about 150 CapitaLand properties worldwide. These initiatives ensure that Green considerations are made at every stage of the project development cycle and enable our environment performance to be tracked for the purpose of continuous improvement. As South East Asia’s largest real estate company, we feel that we can take the lead to help “influence” our stakeholders to adopt a greener way of life. Our “Building A Greener Future” Programme seeks to reach out to the public as we want to engage everyone to play an active part in protecting the environment. Our mascot CapitaFrog is specially created to help spread this message to the community. The first initiative included the CapitaLand Green-Shopping Bag and a mini-loyalty programme to encourage shoppers in our malls to adopt a greener way of shopping. A total of 168 CapitaLand Recycling Bins have also been placed in our malls, office buildings and serviced residences to encourage our shoppers, tenants and residents to recycle. The third initiative combines two of CapitaLand’s corporate social responsibilities. The “Green for Hope” Project, which is open to all primary schools in Singapore, encourages young children to recycle. In turn, these children will also help their less fortunate schoolmates. For every kilogramme of waste the school recycles, CapitaLand’s philanthropic arm, CapitaLand Hope Foundation will donate S$2 to the school’s welfare fund to help underprivileged students. 2. Why did your organisation decide to go green? Our company’s credo “Building People” illustrates our beliefs. We believe that if we can build good homes, offices, serviced apartments and shopping malls, there will be tremendous social effects. Going green not only impacts society of this generation, but the next generation as well. Given CapitaLand’s extensive portfolio spanning more than 120 cities in over 20 countries, we believe our efforts will have positive influence on many communities globally. For a new project with green features, the initial cost may be more, but we look at the life cycle cost of the building, especially in terms of the operation and maintenance costs of the building. With market demand and continuous research, prices of green features will only come down. So there is a compelling case for going green. 3. What are the challenges faced by your organisation in going green? As a multinational company, the challenge is in the implementation of green practices group wide. The CapitaLand Green Committee is guided by a Steering Committee comprising CapitaLand’s Council of CEOs. The strong leadership involvement demonstrates management’s commitment towards CapitaLand’s green initiatives. The Green Committee also ensures that the knowledge and expertise that CapitaLand has built up over the years are consolidated and applied Group-wide. 4. How has going green help your organisation? There are many benefits of going green. Besides creating a more comfortable and pleasant environment for the users of our buildings, the green features in our commercial buildings and retail malls lead to energy and water efficiencies. Green features in our developments include energy efficient air-conditioning and building management systems and environment-friendly architecture and designs. These environmentally friendly features go a long way in helping us and our tenants save costs in the long run. 5. Does your organisation have other green plans over the next few years? Over the past years, we have focused on “greening” our properties and their surroundings. Whilst CapitaLand continues to provide the infrastructure of green buildings and green processes, we recognise that we still need the people who live, work and play in our buildings to effectively protect the environment. There will be more initiatives unveiled under the “Building A Greener Future” programme in the coming months to engage more of our stakeholders, both in Singapore and overseas. 6. What advice would you give to organisations who are interested to go green? Going green benefits an organisation in more ways than one. We feel that it will lead to more satisfied customers and therefore better sales and higher revenues. Employees are happier, more productive and will create more value for the organisation in the long term. Business partners will also be more forthcoming and this will result in synergies and improved efficiencies. Last but not least and perhaps most importantly, by giving back to the community, an organization helps to build a society that is better off as a whole. As consumers and global investors are now becoming more discerning and aware of environmental issues, we need to engage our stakeholders to better understand and manage the impact our operations have on society and the environment, and to identify business opportunities for the future. With the rising cost of fuel, electricity, water and waste disposal, there are good and practical reasons to implement technologies that help conserve energy and produce less waste through eco-efficiency. Having an environmental management system also allows a systematic look at existing business processes which could lead to more efficient use of resources. This interview is conducted with Mr Baey Yam Keng, Vice President, Corporate Social Responsibility of CapitaLand Limited. Visit CapitaLand’s website at www.capitaland.com.